Choose from our flagship brewpub in Uptown Oakland, a Treasure Island oasis, a park-side nanobrewery, or a cozy, hilltop ski lodge. Each Woods location is unique, and the perfect fit for your private event. We welcome groups ranging from 2 to 200. Featuring a private mezzanine within our bustling bar, Woods Bar and Brewery has space for parties small and large. We’ve hosted everything from wedding receptions to business meetings, networking mixers to dance parties. Book a private party in our upstairs mezzanine or rent out the whole bar for larger crowds. Celebration, presentation, or boogying ’til the wee hours — we’re open to anything! Our mezzanine is flexible and private, and we’ll help you customize the space to fit your needs, with tables for a cocktail party, chairs for a lecture, or a simple, spacious dance floor. You’ll get exclusive use of the space, a separate sound system for live music or your own curated playlist, a dedicated staff to help host, a private restroom, and space for up to 65 guests with seating for 30. We can set up a private bar for your guests with a selection of our freshest beers — made right where you’re partying, in our tile-lined, three-barrel brewhouse — as well as wines, cider and non-alcoholic beverages. Have a larger party in mind? Rent our entire space, including an indoor/outdoor patio, fireplace, and cozy bar with eleven beers on tap and a bumping house sound system. Perfect for a larger party of up to 200 guests! We serve freshly baked savory empanadas from El Porteño, great handheld snacks that pair deliciously with our beers. Interested in bringing in your favorite caterer or supplementing our snacks with your own food? That works too! Interested in reserving a table? Want an oasis all to yourself? 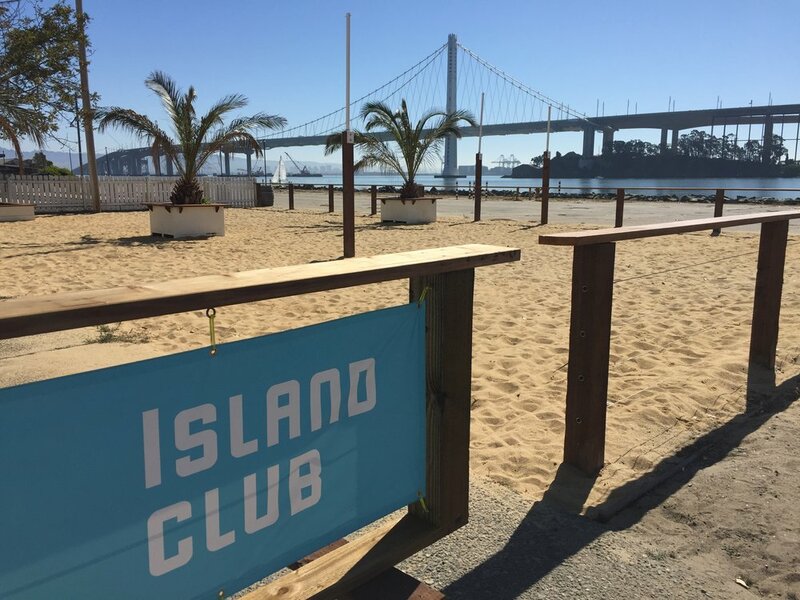 A true gem, Island Club is our largest and most versatile venue, with plenty of space and the best views in town. Host a company outing, stage a scenic photo shoot under the palms or plan any kind of celebration with us. 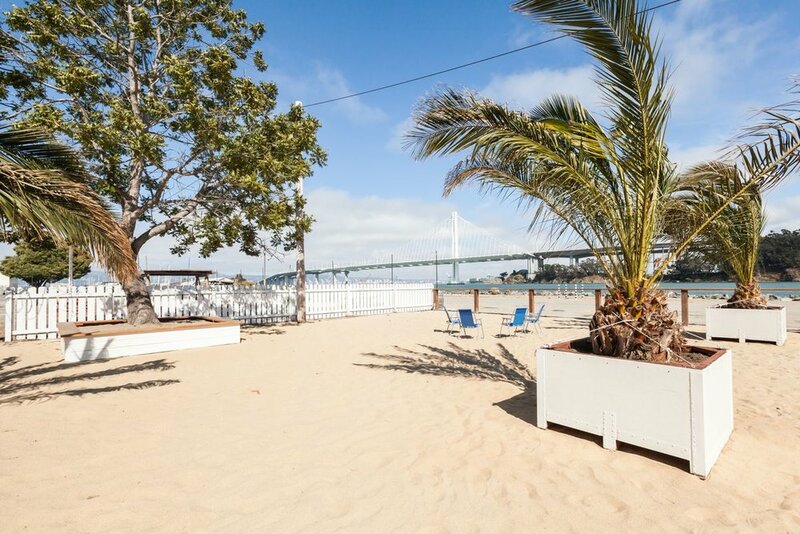 We have a large indoor bar serving fresh-made Woods beers, an outdoor patio with traditional biergarten tables, and a Beer Beach — complete with sand, palm trees, and lounge chairs — all under stunning views of the Bay Bridge, San Francisco skyline, and rolling Oakland hills. Snack on freshly baked savory empanadas by El Porteño, bring your own picnic, favorite caterer, or even a food truck. Book the whole compound, and bring up to 250 guests for dancing, drinking, eating, and relaxing under the stars. Use of the Island Club includes all our beachy games, a house sound system, firepits, and a dedicated staff to help you host. Private events are available 7 days a week. Reservations are also available Saturday and Sunday, noon - 5pm. Gather your friends, roll up your sleeves, and make your own beer at our original nanobrewery in San Francisco. 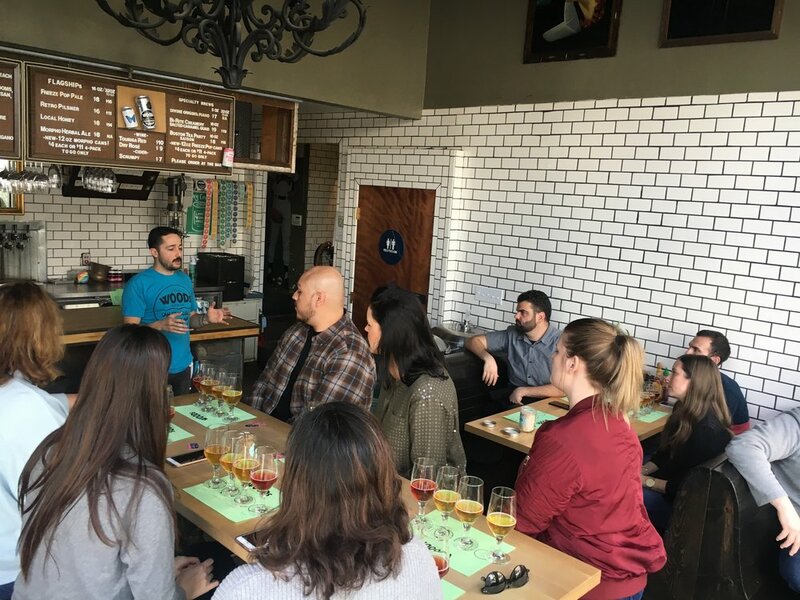 Cervecería is conveniently located across the street from Dolores Park, right between the Mission and Castro — a perfect, central location to gather the crew for an offsite meeting, educational team outing, or personal brewing lesson before enjoying a beer in the park. Want to really nerd out? Bring your most wild and experimental ideas and collaborate with our pro brewers to build a recipe around your personal taste — then be the life of your next party when you serve your own custom-made beer at your wedding, office, or home! We’re available on weekdays before business hours, for groups up to 50. Your favorite neighborhood bar is now available to book for your next get together. With its cozy and charming interior, Woods Polk Station is the perfect place to enjoy exclusive use of a small bar for casual occasions. Come celebrate birthdays, engagement parties or gather friends and watch your favorite team on game day. We’re available seven days a week, day or night, for groups up of up to 35 guests. Just blocks from the roaring shore, Outbound is a polished piece of sea glass tucked within San Francisco's friendly Outer Sunset district. With rotating art shows, a thoughtfully curated wine list, and a private patio, our mellow bohemian bistro is the perfect place for smaller gatherings. Host an intimate celebration, release party or a pop-up if you're involved in the vibrant local culinary, arts or music scene. Gather your friends and family to toast a sunny day in the waves or warm up around the fire when the fog rolls in. Gather your friends and coworkers, roll up your sleeves, and make your own beer! Brewtorials let you and your friends fill the pots and fire the kettles, collaborating with our brewmasters on a special recipe as you explore firsthand the ins and outs of craft beer, from ingredients to history to, of course, tasting. Brewtorials make a great one-of-a-kind gift, party, or staff outing; and can be themed to fit whatever your group is thirsty to learn. A team brew is a great way to generate ideas, celebrate camaraderie or gather your friends and family for a unique experience. Every Brewtorial includes an introduction to our brewer, an overview of the brewing process, a selection of hops to smell, a variety of different malts to taste and of course, our beers to drink. You’ll have the opportunity to step into our nano-brewery and assist in the various steps involved along the way to making a delicious beer. Brewtorials are designed to demystify brewing and share how we do what we do in a fun and collaborative environment. Brewtorials take place at Woods Cervecería, conveniently located across the street from Dolores Park, right between the Mission and Castro — a perfect, central location to gather the crew. Available add ons to the brewing experience can include a catered lunch, a private meeting space or Woods merchandise to gift your guests. Brewtorials are available for groups of up to 20.